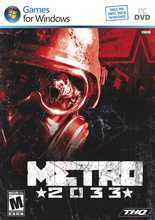 <br>Set in the shattered subway of a post apocalyptic Moscow, Metro 2033 is a story of intensive underground survival where the fate of mankind rests in your hands. In 2013 the world was devastated by an apocalyptic event, annihilating almost all mankind and turning the earth's surface into a poisonous wasteland. A handful of survivors took refuge in the depths of the Moscow underground, and human civilization entered a new Dark Age. The year is 2033. An entire generation has been born and raised underground, and their besieged Metro Station-Cities struggle for survival, with each other, and the mutant horrors that await outside. You are Artyom, born in the last days before the fire, but raised Underground. Having never ventured beyond your Metro Station-City limits, one fateful event sparks a desperate mission to the heart of the Metro system, to warn the remnants of mankind of a terrible impending threat. Your journey takes you from the forgotten catacombs beneath the subway to the desolate wastelands above, where your actions will determine the fate of mankind.